Take two bottles into the shower? Why would I do that when there are already twenty seven in there. What are they all for? I thought that we had a breakthrough this week. After Zac added bacon to his list of acceptable foods I wrapped some chicken breasts in bacon and served them up, Zac was impressed. Actually, ‘impressed’ is probably too strong a word. He was ‘tolerant’ of it, and agreed that he could perhaps eat one. Delighted, I gave him a box of microwave chips, and he was munching away. Eventually he admitted that the last few morsels were a bit chewy, but he had eaten most of it. All was going well, until I found the box that the chips had been in. Now all that it contained was chicken and bacon that he had picked apart and then discarded. I estimate that he had eaten perhaps 10%! He is clearly no Abraham Lincoln. Something to look forward to – we have booked to go on holiday to Cuba in March. I have to say that this is the first time I have booked a package holiday for many years – and it certainly wasn’t as easy as it should have been. The Thomas Cook and Co-Operative travel websites are terrible (they are supposed to be the same company!). And it doesn’t stop with the booking. Allocating seats didn’t work either. But – its done now, and ominously there will be 13 of us heading for the Caribbean just after Easter. Its been a busy time in the kitchen. roast lamb and chocolate chickpea muffins were followed by tomato soup, then more tomato soup as the first lot had all gone. Today I have made the aforementioned turkey goujons (stop press – Zac says they taste funny and won’t touch them), chilli chicken and Italian chicken. I’m staying over in Nottingham for two nights – got to ensure that Ole doesn’t starve and Sally doesn’t live off chocolate! Zac will please himself. My latest visit to the physio was informative. She told me I should walk more slowly to avoid limping, then she said I should treat the wound with E45 cream. It was all very positive, so much so that I made my first cycling trip on Sunday, all the way to Tesco and back. Not pleasant on the back road – very muddy! Anyway, I did the same trip today, this time on the road, and the knee is showing no ill effects. The consultant is also pleased with it – but he wants to keep the heat in the wound as apparently it helps the healing process. Won’t be too long before I reach out towards Marple again, weather and canal closures permitting. Its been a hectic weekend with the NFL playoffs. Cincinnati threw away a game in a way that just doesn’t happen in other sports, which is what makes American Football so fantastic. Ok. it might take three hours to get to that dramatic moment, but the wait makes it all the better! David Bowie died this week, and its interesting how celebrity deaths have changed due to social media. I remember when Elvis died, I tweeted my sadness, posted a grainy Youtube clip and that was it. Today, Facebook was full of it. Interesting that no one posted these clips of Bowie before his death. I know a lot of these are genuine, but a lot are clearly jumping on the social media celebrity death match bandwagon. I admired a lot of his music, but Let’s Dance? China Girl? No thanks. Eddie Izzard tweeted his opinion. Thanks for that Eddie. I feel so much better knowing that you are hurting! I remember when grief used to be a private affair. I only ever had one Bowie song, and I am pretty sure I didn’t buy it. It was Laughing Gnome. One of the few tracks I’ve not seen on FB today! I was always much more into Marc Bolan. When he died school was a real struggle. I wouldn’t have dared to read what people were posting on Facebook! So, if you are saddened by the death of Bowie or any other celebrity i hope that your grief does not run too deep. If you feel the need to splash your grief all over social media in an attempt to top (not in the biblical sense) Eddie Izzard, my sympathy is greatly diminished. Unless you are Bernie. I remember him being a massive fan! Zac wants a butterfly knife. 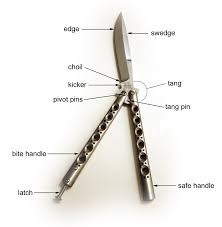 Any idea what a Butterfly Knife is? Well I didn’t until I Googled it. Then I found out that they are illegal. Hardly surprising really. Anyway, he kept on about it so I’ve bought him a training version. I am assured that they cannot harm anyone, including the owner!